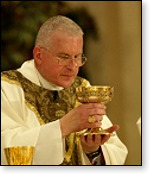 * "The Church stresses that a well-formed Christian conscience does not permit one to vote for a political program or an individual law which contradicts the fundamental contents of faith and morals.... John Paul II, continuing the constant teaching of the Church, has reiterated many times that those who are directly involved in lawmaking bodies have a 'grave and clear obligation to oppose' any law that attacks human life. * "Among all the crimes which can be committed against life, procured abortion has characteristics making it particularly serious and deplorable" [Pope John Paul II, 'Evangelium vitae,' n.58]. * In treating the evil of procured abortion, Pope John Paul II concluded: "No circumstance, no purpose, no law whatsoever can ever make licit an act which is intrinsically illicit, since it is contrary to the Law of God which is written in every human heart, knowable by reason itself, and proclaimed by the Church" [Pope John Paul II, 'Evangelium vitae,' n.62d]. * "Laws, which authorize and promote abortion... [are] radically opposed not only to the good of the individual but also to the common good; as such they are completely lacking in authentic juridical validity. Disregard for the right to life, precisely because it leads to the killing of the person whom society exists to serve, is what most directly conflicts with the possibility of achieving the common good. Consequently, a civil law authorizing abortion or euthanasia ceases by that very fact to be a true, morally binding civil law. [Pope John Paul II, 'Evangelium vitae,' n.72]. * "To claim the right to abortion, infanticide and euthanasia, and to recognize that right in law, means to attribute to human freedom a perverse and evil significance: that of an absolute power over others and against others. This is the death of true freedom: 'Truly, truly, I say to you, every one who commits sin is a slave to sin'" Jn 8:34 [Pope John Paul II, 'Evangelium vitae,' n.20]. * "The Church's custom shows that it is necessary for each person to examine himself at depth, and that anyone who is conscious of grave sin should not celebrate or receive the Body of the Lord without prior sacramental confession, except for grave reason when the possibility of confession is lacking; in this case he will remember that he is bound by the obligation of making an act of perfect contrition, which includes the intention to confess as soon as possible. Moreover, the Church has drawn up norms aimed at fostering the frequent and fruitful access of the faithful to the Eucharistic table and at determining the objective conditions under which Communion may not be given [Ecclesia de Eucharistia n. 42]. 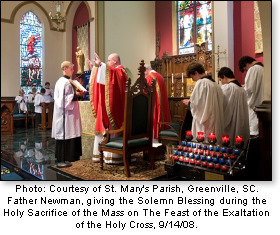 It is certainly best that all who are participating in the celebration of Holy Mass with the necessary dispositions should receive Communion. Nevertheless, it sometimes happens that Christ's faithful approach the altar as a group indiscriminately. * "Abortion and euthanasia are thus crimes which no human law can claim to legitimize. There is no obligation in conscience to obey such laws; instead there is a grave and clear obligation to oppose them by conscientious objection. From the very beginnings of the Church, the apostolic preaching reminded Christians of their duty to obey legitimately constituted public authorities [cf. Rom 13:1-7; 1 Pet 2:13-14], but at the same time it firmly warned that 'we must obey God rather than men' [Acts 5:29]. ... It is precisely from obedience to God -to whom alone is due that fear which is acknowledgment of his absolute sovereignty - that the strength and the courage to resist unjust human laws are born. It is the strength and the courage of those prepared even to be imprisoned or put to the sword, in the certainty that this is what makes for 'the endurance and faith of the saints' [Rev 13:10]. "In the case of an intrinsically unjust law, such as a law permitting abortion or euthanasia, it is therefore never licit to obey it, or to take part in a propaganda campaign in favor of such a law, or vote for it" [Pope John Paul II, 'Evangelium vitae,' n.73]. 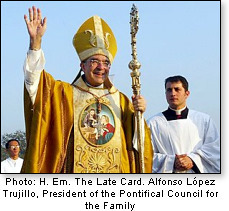 * "The Church's teaching on the intrinsic evil of procured abortion forbids the destruction of human beings from the moment of fertilization through every stage of their development. Therefore, one cannot justify a vote for a candidate who promotes intrinsically evil acts which erode the very foundation of the common good, such as abortion by appealing to that same candidate's opposition to war or capital punishment" [cf. Catechism of the Catholic Church, nn. 2265 and 2309]. * "There is only one thing that could be considered proportionate enough to justify a Catholic voting for a candidate who is known to be pro-abortion, and that is the protection of innocent human life. That may seem to be contradictory, but it is not. "The Catholic can vote for candidate (C, Peroutka) but that will probably only help ensure the election of candidate (A, Kerry). * "It is a tragic irony that "pro-choice" candidates have come to support homicide [abortion] - the gravest injustice a society can tolerate - in the name of "social justice.... A person who supports permissive abortion laws, however, rejects the truth that innocent human life may never be destroyed. This profound moral failure runs deeper and is more corrupting of the individual, and of the society, than any error in applying just war criteria to particular cases...some evils, such as abortion and euthanasia in particular, take precedence over other forms of violence and abuse. While the Church assists the State in the promotion of a just society, its primary concern is to assist men and women in achieving salvation. 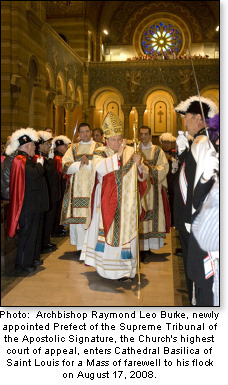 For this reason, it is incumbent upon bishops to correct Catholics who are in error regarding these matters. 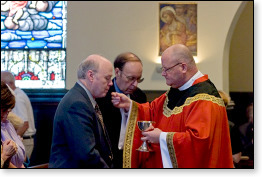 Furthermore, public officials who are Catholic and who persist in public support for abortion and other intrinsic evils should not partake in or be admitted to the sacrament of Holy Communion [canon 915]. 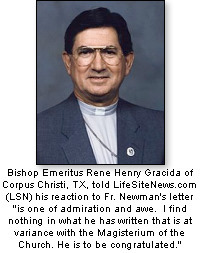 As I have said before, I will be vigilant on this subject" ['A Pastoral Letter from Bishop Martino,' by Joseph F. Martino, Bishopof the Diocese of Scranton, read at all Masses on Respect Life Sunday, October 4-5, 2008]. 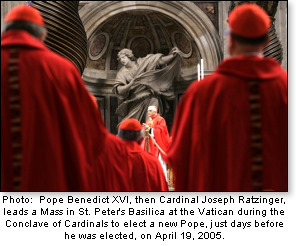 Please go to 'Part One' to examine what the Catholic Church, its Popes and its Bishops, teach us about its Church members wrongly voting for pro-abortion politicians.